Emergency responders investigate the scene of an accident in Oakley involving a bicyclist and pickup truck (September 5, 2016). 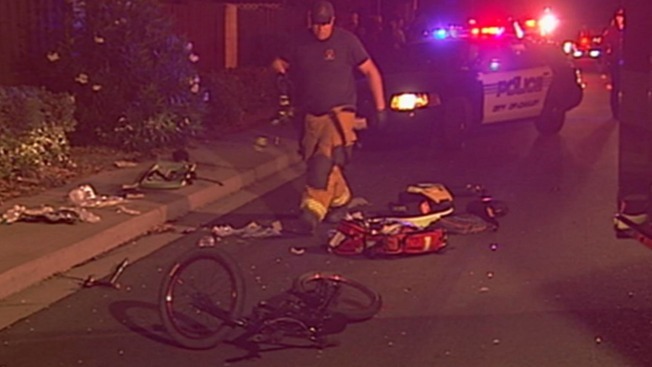 A juvenile bicyclist from the East Bay that was hit by a pickup truck just blocks from his home Sunday evening has died, police said. The 14-year-old boy was riding on a sidewalk in Oakley around 8:30 p.m. when he swerved to maneuver around pedestrians before being hit head-on by the truck, Oakley Police Department Sgt. Steve Perata said. The teenager was rushed to the hospital, but was pronounced dead around 5 a.m. Monday at Children's Hospital in Oakland. Sgt. Perata said that the boy was likely on his way home after a day spent fishing when he was struck just two or three blocks from his house. Police are investigating the accident and they say that the driver, who was determined to not be under the influence of alcohol, is cooperating. Sgt. Perata added that the driver is not expected to be charged. The child's identity has not yet been released, Sgt. Perata said.